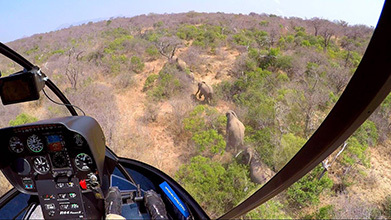 Approximately 1.5 hour duration from departures from the Hoedspruit Civil Airstrip. Time and price may vary depending on collection point. Fly low over the many citrus farms and ease into the twists and turns of the Blyde River Canyon. Admire the many incredible rock formations, fauna, flora and colours of this special environment. 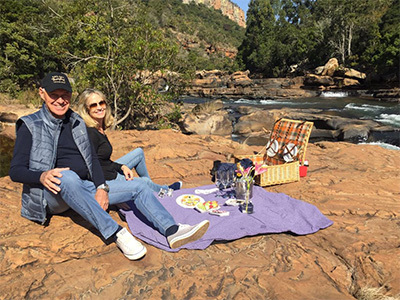 Touch down in a remote spot (either next to the waterfall or on a mountain top) where your pilot will make themselves scarce while you enjoy your picnic in this isolated area. Once finished your pilot will whisk you away back to your collection point. The picnic as well as still and sparkling water is included in the price. The R66 is used for this excursion as it has the storage compartment. Prices will vary depending on collection and drop-off point. Excluding any soft drinks or alcoholic beverages. Approximately 1 hour duration from departures from the Hoedspruit Civil Airstrip. Time and price may vary depending on collection point. 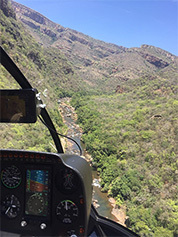 See points of interest such as the Bourkes Luck Potholes and the Three Rondawels from the air. Get whisked back to your collection point. We have the luxury of being able to offer you the ultimate way of arriving at your luxury lodge in a remote corner of the bush. The R66 allows us to take 4 passengers plus luggage to a lodge of your choice instead of taking the notoriously bumpy roads to get to these special places. Picks ups and drop offs usually take place from Eastgate Airport (HDS) to any lodge in the vicinity provided they have a landing area. Permissions will also need to be granted by reserve security.